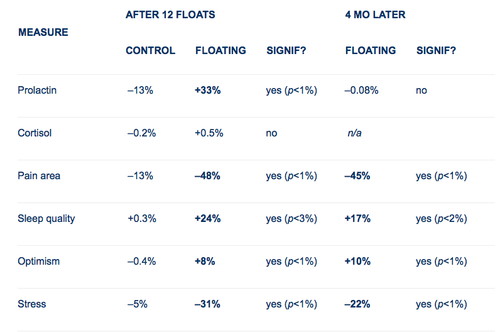 Many scientific studies have been made to quantify the beneficial effects of floating. And does this therpy have measurable biochemical effects? Does everyone experience these effects? If a person has tension headaches, for instance, does this relaxation effect actually help them? And if so, how long does the effect last? Many find relief from being away from gravity, even if only an hour. While floating, the pressure of gravity is taken off the joints and muscles and the body as a whole is put in to a high state of physical relaxation, blood pressure and oxygen intake are educed yet at the same time blood flow and the distribution of red blood cells are increase. The combined effects are of particular benefit to athletes, speeding recovery from injury and assisting in the flushing of lactate, cortisone and adrenaline that may have built up either through training or performance. One study done recently in Sweden says the answer is yes, and the effects seem to last for months. In 2005 Sven-Åke Bood and the Human Performance Laboratory research group at Karlstad wanted to dig in to the long-term relaxation effect from floating (“Eliciting the Relaxation Response With the Help of Flotation REST in Patients with Stress-related Ailments”, Bood et al, International Journal of Stress Management 2006, Vol. 13, No. 2, 154–175). Their goal was to take a group of patients who were already diagnosed with chronic stress-related muscle tension pain, allow them to use a float tank for an extended series of sessions, and see what happened. Bood’s group found 70 patients to participate in the study. On average, the patients reported having had recurring or chronic pain for 12.1 years, and 90% experienced pain at least weekly. 65% experienced pain daily. 37% also were diagnosed with clinical “burnout depression” (this is apparently a diagnosable thing in Sweden). So, this was a very stressed-out group of people. The test group was scheduled to come in for two 45-min sessions twice a week for three weeks, then a week off, then twice a week again for three more weeks — twelve sessions in all. The control group had the same schedule to come in to the clinic, but simply read quietly in armchairs instead of floating. Forty-five minute sessions, incidentally, are somewhat short. Anecdotally, most floaters describe greater effects after an hour or longer. The study participants gave blood samples to be tested for cortisol and prolactin, and filled a battery of standard psychological profile tests for things like subjective pain, sleep quality, and symptoms of depression. Here we have bolded the areas which has significant benefical effects. The test group showed substantial improvements after floating 12 times to measures of their subjective pain, sleep quality, optimism, stress, anxiety, and depression. This is a huge effect! The floaters’ stress-related pain was down by nearly half, four times more change than was experienced by the control group. Their sleep quality was up by a quarter and anxiety and depression down by a quarter to a third, while the control group experienced very little change. What’s more, the bulk of these benefits were still maintained four months later. Four months is hardly enough to assert that the participants’ pain and depression is “cured” or might not eventually return to pre-test levels, but four months of maintained benefits with no further treatment is impressive. The prolactin and cortisol results are interesting in their own right, but not clearly understandable. Cortisol is generally considered “the stress hormone”, so one might expect a reduction after a series of flotation sessions; this was not observed. Something biochemical clearly does occur, however, as shown by the strong elevation of prolactin levels. Prolactin is actually not a well-understood hormone. It’s conventionally known to stimulate milk production in nursing women, but it seems unlikely that that has much to do with its action here. It is also known to rise during extensive physical exercise, and during the healing of wounds, reparation of tissue, and during sleep. Bood et al. speculate that prolactin may be associated with “a vitality-enhancing effect for an organism under pressure which, despite this circumstance, manages to experience relaxation.” The elevated levels at the end of the 12-session protocol may then be an indication of active healing underway, which falls away after the sessions end, and by four months later prolactin has returned to its base levels.